As frequent readers know, there is a ratings box at the end of each article - or there was. I have just removed it from the site. Adding widgets like ratings or "yes/no" buttons to content is, in theory, a good idea. It drives up engagement, makes people feel that they are a part of something, and removes some of the invisible obstacles to sharing. It sounds good, but that is not actually how it works. The problem with rating widgets is that the first person rating an article carry far too much weight. Essentially, the first person to rate an article also determines its future success or failure. If the first person rates it really low (only one star) that rating dramatically impacts all other readers. Even if they happen to like the article, they are going to wonder why the "general public" don't like it. Why are everyone else giving it just one star? 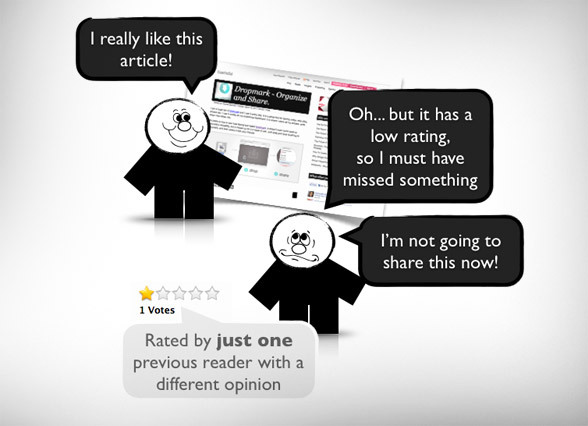 The result is that people don't share articles with a low rating, even if they happen to like it. The effect is a dramatic drop in sharing and user engagement - just because the first reader happened not to like the article. One reader has the power to define the opinion of others. We need a different way to rate content. One where the initial rating does not influence the people reading the article afterwards. One that gives us the social effect, and the engagement, but doesn't define a specific outcome. I just don't know how to make that. Any ideas? Note: This is probably why Facebook hasn't implemented the unlike button, yet.